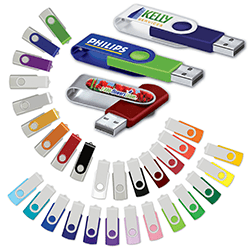 USB flash drives are an all-around favorite. Stylish swing design protects USB connector. Hi-speed USB 2.0 swing flash drive with silver metal cover. It is also PC and Mac compatible. 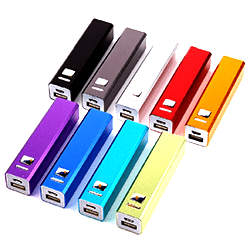 This compact flash drive will make a sizable impression on potential customers! USB is available in 3.0, 32 GB, 64 GB. 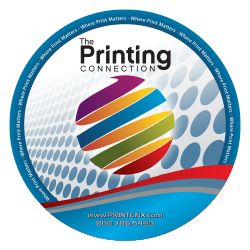 We offer a wide variety of options that can be customized for your marketing needs. We can provide you with ones you already have or we can give your company a brand new look. 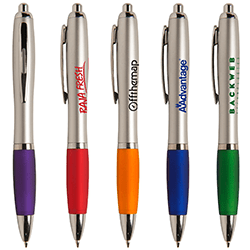 Pens are wonderful for giveaways, office use, or to give to your customers as a constant reminder. Don’t you have a favorite pen you use? Why not make it one with your company logo. 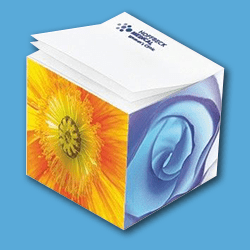 Our wide selection of custom sticky notes and promotional notebooks are must have items for home, school and office. These items will reinforce your message with the turn of each page. Our wide variety of colors, shapes, sizes and sheet amounts makes customization a breeze. Design yours now! We also offer booklets! Fabric Surface Mouse Pads are now antimicrobial! A tried & true promotional workhorse, Fabric is our most economical and most popular mouse pad. Printed with vivid full-color or rich spot color Sublimation, your image will definitely make an impression. These mouse pads are great for any promotion-events, meetings, trade-shows, web sites & more. 1/8″ is our most popular thickness. 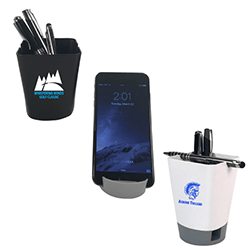 This unique product looks like a standard pen holder however it has a detachable bottom that is also a cell phone stand. A pen holder is something everyone would find useful but the innovative twist of doubling as a cellphone holder really is eye catching. The small groove slot on the top can be used to place the writing utensil most commonly used for quick access. 1800, 2000, 2200, 2600, 2800, 3000, 3200 (mAh).